After all this tablet talk, I ended up with an Asus T200 - same processor as these but 4GB or RAM, 64GB of internal storage and an 11.6" screen!!! Not as portable as the Stream 7 but an 11" tablet is pretty sweet! Plus it has a detachable keyboard dock with an HDD bay in it, so it basically turns into a netbook. I haven't loaded up the Propeller tools yet to see how those work. I tried to be good and keep it all Microsoft, really, I did. I loaded Adblocker Plus into IE and it worked just fine. Next step is to install Ghostery - there is no Ghostery for IE11/Win8.1, so that's a DEAL BREAKER - IE once again became the installer program for Firefox. Sorry Microsoft, I don't like to be tracked. Chrome will get loaded also. Merry Christmas, happy Hanukah, or whatever holiday you subscribe too!!!! 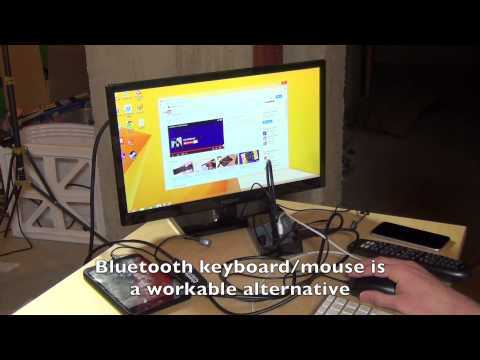 I've been looking at smaller bluetooth keyboards/mice but many are cheaply made and problematic. Some things are really tough to do on a 7" touchscreen - especially resizing columns in listviews (like the task manager). A mouse is probably more useful than a keyboard IMHO. I really didn't get the Stream 7 to run the Propeller or Basic Stamp tools, although it's nice that it will. I missed my old HP PDA which used Window CE. I wrote some Visual Basic apps for WinCE that I relied on, so being able to write/run my own VB scripts and VB programs was the reason I wanted a Windows tablet instead of an Android tablet. Please do tell us how it works. I just mentioned the one in post #44, I guess it was was on sale for one day at $79.99., which have been close to your price. Ok, I've had my tablet for a few days now and here's my review. After adjusting the page file size to 500mb, reducing the hibernation file size, and running CCleaner, I am left with about 5gb of free space after installing Microsoft office, propeller tool, and a few other programs. Also, I have only installed critical windows updates manually (I turned off automatic updates). So far there have been no side effects making these changes. As expected, the tablet operates without any issues. I can get approximately 4 hours of run time between charges. I loaded some music and video files onto an sd card and it plays them without problem. One thing I do like about this tablet is that the sd card slot is accessible from the side without having to remove anything to gain access. The propeller tool works as expected, I loaded the demo program for a quickstart board to check and it ran fine. I was fortunate enough to have a coworker who recently bought the HP stream 7, so I was able to compare the two tablets. Hands down, the stream's screen is much better than the iview's. One thing I did notice was that hp loaded some of there usual bloatware onto their tablet, whereas the iview had no extra software installed other than the OS. This usually isn't a big deal since the extra hp software can be uninstalled. All in all, I'd say that for $50 the iview isn't a bad deal. If you don't already own a tablet I'd probably recommend the stream for $80 (due to the better screen and additional storage). If you want to pay as little as possible, the iview is a good choice also. I have a Lenovo lynx and my wife has an Asus t100, so this tablet will probably stay at work. Spent a lot of time trying to do a System Image Backup for the tablet across the network to my Windows 7 desktop. Getting that working was a royal P.I.T.A.! I had to "Link online IDs", which meant downloading and installing "Windows Live Esssentails" and using my MS Live username/password to link to my WIN7 user account. My HP Stream 7 is in my HomeGroup, but it was still tricky getting it to work - had to set HomeGroup share permissions to Read/Write, etc, etc. Jumped thru so many hoops - I'm not sure I do it all over!! I have this one on order, (should be here today). I think I paid ~$6.00 Ship-To-Store. A 32GB drive, (standard USB plugin), plus a OTG to standard USB cable converter. Works a treat. (see previous posts). Did your StarTech cable work? I just got mine and it won't go in the Stream port?!? It is the UUSBOTG cable like your Stapled link showed. Tried wiggling it but I am not going to force it and screw up the tablet. I picked up the cables yesterday, but did not try it out until your post. The Stapes cable fits well, but now *CRAP*, you need a Female-to-Female USB cable to go to a computer. I have none. EDIT: The cable does allow a USB Flash/External drive to be plugged in. I just want a computer/computer interface. Now it needs an XP virtual machine to handle certain service software that 8.1 can not handle. Win 8.1 quirks with USB serial are windows own, not the stream, vivotab or surface. The Stream 7 comes witha 32-bit version of Windows 8.1, not 64-bit, and a lot of the stuff that "doesn't work with Windows 8" works fine with it. The only application I've had a problem with is one that really needs more than 1 gig RAM. I've installed several USB device drivers and a couple of applications that I know won't run on normal Windows 8 with no problem at all. Thank you for contacting StarTech.com. Sorry to hear you are having some issues with our UUSBOTG adapter. This is a problem we have run into before and I'd like to offer you a solution. We have seen issues with the latches on some micro USB adapters, to resolve this you can use something firm to physically bend down the latches on the micro USB end of the adapter. Once they are physically broken down the adapter will function as normal and this should not have any adverse effects on your devices. The HP Stream's Support Assistant indicates that "Ganges/Colorado 1.0 System BIOS Release" and "HP PC Hardware Diagnostics UEFI" updates are available for the Stream 7. I thought I would make an easel type tablet stand (for the HP Stream 7) from some thin oak but I found this one on eBay (U.S. free shipping). 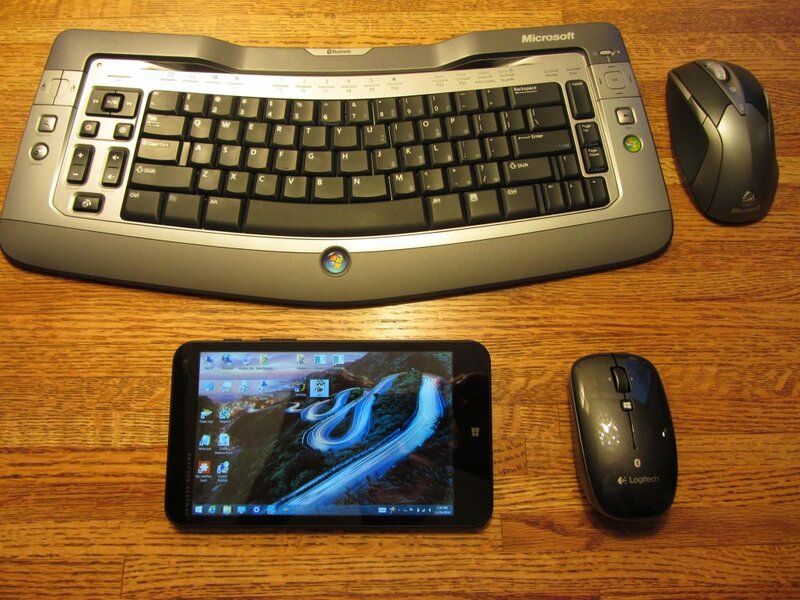 ...a combination keyboard, mouse pad with windows computers, a Playstation, and my Android phone for various things. It's actually quite good on the phone. Good enough I've actually done a little basic programming on that phone. I looked at that keyboard in the store but it's not bluetooth and the HP Stream 7 doesn't have a standard USB port. Maybe you could use an OTG Host cable and a USB hub (powered?) so you could plug in a Propeller board or Parallax USB serial adapter at the same time. Anyone got Linux running on these things yet? but the keys are about the same size as the on screen keys. I did buy this mouse because I found it hard to target areas with my fat fingers. It was $10 off that day. Funny, I must have the wrong picture. Mine looks like that and is bluetooth. It's wireless but not Bluetooth "Unifying receiver with advanced 2.4GHz wireless connectivity allows you to type wherever is most comfortable. Provides a range up to 33'. Requires a USB port." In case you haven't discovered it yet, you can add the standard keyboard layout as a touch keyboard option. Swipe in on the left side of the screen to open the charms menu and select settings and then "change PC settings at the bottom. Under the Touch Keyboard heading set the option on. The next time you open the onscreen keyboard, the keyboard icon in the lower right corner will let you select the standard keyboard layout. I found the Micro-USB connection a little 'fussy'/ erratic with the HP supplied cable, and also found not all 5V sources would give the charge symbol. HP's PSU did, as too did an Apple one. - one poster used a variable PSU, and reports 5.15V is the magic number. I also tested with a cheap HUB powered from 5V.1200mA PlugPack. + a [USB-B to USB-F], as the HUB used a USB-B on the PC port. - this setup works as an OTG adaptor, and powers any downstream USB nodes. Connected to CP2105 target and S7 chirped and then auto-downloaded and installed drivers, and all COMx function worked. Quite seamless. One subtle detail was the two com ports of the CP2105, installed in the reverse order, to the desktop PC. Only minus is this combination does not presently charge the Stream 7, but that may be related to the 5.15v reported. Even connecting the HP plugpack via USB to the hub, for extra power, was not enough. Some reports have S7 charging when off, with less grunty power sources, but that is harder to verify. WinBook now available online for shipping at Micro Center! Had my first Stream 7 hiccup, and thought I'd report it in case anyone else has such a problem. I took the Stream with me on a trip and started it up to find no wifi. Went to Device Manager and found the device driver reporting an error. Stopping and starting didn't help. Removing the device and scanning for new devices to rediscover it didn't help. Finally told Device Manager to remove the device and delete its driver. After that it couldn't be discovered. So from another computer (since the Stream couldn't get on the internet) I put "hp stream 7 wifi driver" into Google and the first hit was HP's download page. Click through to the only OS, and network drivers, and there are the realtek drivers for the wifi and bluetooth. I downloaded the wifi, put it on a thumb drive, and ran it on the Stream. After the mandatory restart the Stream found the wifi and got online. Problem solved, and I have the driver if it happens again. This sort of thing seems to be related to sleep mode, and happens on other platforms, so it's probably more of a Windows 8 problem than anything specific to the Stream. These are on sale at Microsoft for $79.00 at the Microsoft store. At the moment it also includes a $25 Microsoft gift card and some other freebies. I bought one and so far it seems to work really well. I did run into an issue with the WiFi after using it connected to a cell phone hotspot instead of my normal WiFi. After a while the connection would change to "Limited connection" and refused to work any more. The issue persisted even connecting back to the main WiFi. When doing an ipconfig /all form the command prompt everything looked ok but I did notice it had an IPv6 address as well. In the past I've seen some odd IPv6 issues and I think that the phone WiFi gave out an IPv6 address that was no longer working. I just went to the network properties for the WiFi adapter and temporarily disabled IPv6 and rebooted. After that is has been working perfect. Eventually I will enable it again and do more troubleshooting. If you have one of these tablets and have WiFi issues then you may want to try this to fix it. That would have saved me 60 bucks and had $75 dollars in coupons when I ordered three in December. I'm getting a HotSpot pretty soon, so thanks for that heads-up.